Right now the mason bees are bursting out of their little cocoons at Chickadee Gardens. 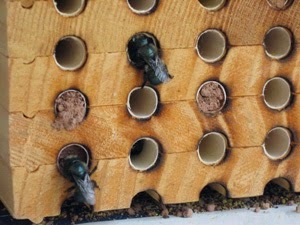 Having recently attended a class at the Backyard Bird Shop about keeping mason bees, I thought it would be a great opportunity to revisit some key points and refresh my own memory. We have three years of experience hosting them, and while I am certainly no expert on the matter, I would love to share what I have learned and also invite others to participate in this conversation about the how/why of mason-bee keeping. There is much I hope to learn about these amazing creatures. Photo courtesy of USDA. Aren't they pretty? No, they are not flies! Unlike a colony of honey bees, mason bees are solitary creatures and do not form hives, not in the sense we know - nor do they produce honey. So why then would one want to "host" mason bees? Mainly because they are excellent pollinators. With the decline of honey bees (which actually come from Europe), pollination is a critical issue. No pollination means no food for people. 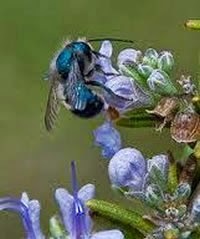 There are many species of mason bees, the Blue Orchard mason bee is what I have and is most common in this area (the order is Hymenoptera and the Latin name is Osmia lignaria). This is the one we will focus on, and it should be mentioned that these are native to North America. 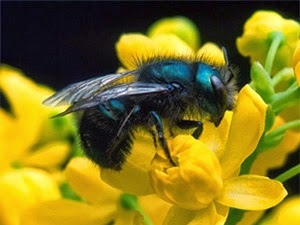 They are different from honey bees; they are smaller and black with an iridescent sheen. They have four wings and although they do have stingers, they do not use them, they are quite gentle. They also only live for a year. 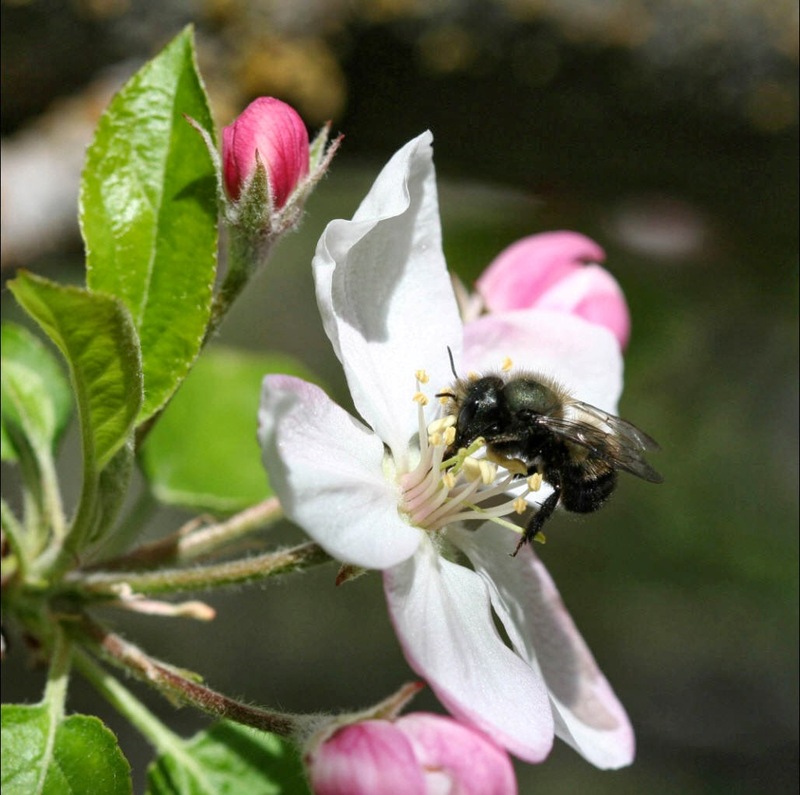 Since they fly at lower temperatures and when cloudy, this means that your early blooming fruit trees (and anything else blooming) are adequately pollinated. They peak when pollination peaks between May and June. They emerge around March 15th---so just about now! In early to mid-March they are emerging as adults from their cocoons. The nests, or tubes, contain several cocoons in each one, the females are at the rear and the males up front. The males emerge first and go looking around for pollen and await the females' emergence so they can mate. The females follow some three or so days later. They mate, she starts to collect pollen for the eggs she will lay and then she finds another place to nest (hopefully provided by me or you). She then lays the egg with the pollen as a food source for the larvae and continues on until the tube is full. It should be noted that in the wild they simply look for a cavity that is warm and dry with ideally a hole 5/16" wide by about 6" long. By providing them a clean, hopefully safe home we increase their odds of survival. It takes her 25 full loads of pollen for one egg, which is about 75 flowers' worth of pollen. This continues on until she has filled up a tube. The average tube or nest (one tube = one nest) consists of 2 - 4 female eggs and 5 - 8 male eggs. At the end she will cap it off with a bit of mud, then die by the first of June. The males are long done with their life by this time. The larvae now spins cocoons and pupates between July and September, it's best not not disturb the nests during this time. At this point, there is a full-grown adult inside the cocoon and one school of thought says that between November and December while the adults are dormant, you should wash the cocoons and the mason bee nests. In the wild, of course, this does not happen and well, it's not necessary. It is simply a matter of managing your bees' health as disease, mites and other pests can easily wreak havoc on these little guys, so whatever can be done to increase their populations the better. If you do decide to clean the whole thing out, you can remove the cocoons (in November/December), wash them in warm water, clean out the holes and tubes and replace the hole liners with fresh ones. I have yet to do this, and it's worked fine thus far. But I will this next season. You see the first "nest box" I bought was simple drilled holes in a block, which once they are filled up you can't pull anything out to clean, as they have no liners. I had to wait the following March for the bees to emerge. They did, then IMMEDIATELY re-nested in the old holes. **sigh** The second year, I bought a second nest which has tubes with liners so I can clean them out at some point. This second nest filled up right away in April/May of 2013. This is the third spring with the bees, and I have a third sparkly new box with fresh liners and tubes in the hopes that they will occupy this one and give me the chance to do some cleaning this winter. When you do decide to clean: Wash them in warm water, gently remove dirt from the cocoons. Debris will sink and the cocoons will float, let them rest for 5 - 15 minutes then rinse them in a sieve until the water runs clean. Allow them to air dry on a towel until completely dry---about an hour. Scrub the nesting trays with warm water and let them air dry as well. Store the cocoons in a cardboard box inside of a metal container (such as an old cookie or candy tin) with holes punched in it for air. I was told to place them on the north side of your home to stay cool, just make sure they are safe - if the original location of your bee blocks is safe, it's probably ok to place them nearby. Come springtime, take them out of the metal box, punch a hole in the cardboard and they will find their way out. How to start, you ask? How we started was with one mason bee block in the summer of 2011 and purchased cocoons from the Backyard Bird Shop in January or February of 2012. Those were in the fridge until March, then we taped the tiny cardboard box to the top of the block. The cocoons hatched, they chewed through the cardboard and were on their way, pollinating and making bee babies and soon filling up the vacancies in our new bee block. It's grown exponentially since then, and we are learning as we go. This is the original "bee block" we purchased in 2011 - see the open holes? Those were full last week. They have only just begun! Lots more to come and the warmer weather expected at the end of this week should send them all out into the wild. Yes. Case in point: Our lone apple tree produced about four lowly fruits in 2011. In 2012, we had about 100 apples. Surrounding fruit trees can and do benefit also, in fact they aren't called orchard mason bees for nothing. Orchardist rely on these little miracles. Think of all the apples, pears, almonds, peaches, plums, hazelnuts we wouldn't have. Adding healthy pollinators to the environment helps the natural balance of the planet. When you are ready to host mason bees, what should you do? Buy or make a house. Backyard Bird Shop, Portland Nursery and many local nurseries and online suppliers sell supplies and ready made houses (see the end of this post for some resources). You can also go online for specifications for building one yourself, but basically it's a matter of being a 5/16" diameter hole, 6" deep. They like wood, but don't use fresh cedar; it's not good for the bees. Use aged wood, untreated, too. You have choices when you buy pre-made houses, either wood block systems, tubes with liner systems or stacked tray systems. They all work, it's just up to you. I have a wood block system (no liners used, they have limits), and two tubes with liner systems. Here's the second one we purchased last year complete with removable tubes and disposable liners. With east to southeast exposure. They want warm morning sun, 4 - 5 hours is ideal. Afternoon sun or west-facing will fry the little guys, north is too cold. Protection is crucial, from weather and from hungry birds, although we've been lucky so far on both counts. At least 4 - 5' off the ground, too. Here's my newest one, and unoccupied as of now...will probably (hopefully!) be full by June. The tubes can be easily removed for cleaning and to replace the liners. Liners are pretty inexpensive, about $7 for a box of about 30. Side view - I guess it's ok they are sticking out, but come this winter I am going to move them after cleaning the cocoons. All of these nest boxes are facing east, about 5' - 8' off the ground and in a fairly sheltered garden. A source of mud. The less they have to spend energy fly around looking for it, the more energy they can spend on making babies. And fresh water, of course. Everybody needs that. Everybee, I mean! While it may be too late in the season to populate your mason bee blocks with cocoons from a friend or purchased at a nursery or other source (for sale during December/January/February into early March), it's not too late to think about next year and stock up on supplies. It's a fascinating process to watch and they are a lot of fun to observe hovering around the garden. As I mentioned, they are totally gentle and quite beautiful with their iridescent bodies. We are proud "bee parents" and welcome these little guys, even if we don't have an orchard. It's just another small, simple and really effective way of making your garden space a little better for the planet. Plus, it's really not time-consuming at all, and would be an excellent project for curious little minds. We highly recommend it. There is so much more information out there, if this has piqued any interest for you, I highly encourage you to do some exploring and go for it. We did knowing absolutely nothing, with simply the desire to learn about and encourage nature. Great overview, Tamara. I attended Sarah Nelson's talk on Mason Bees at Drake's 7 Dees a few weeks ago, and got all revved up to encourage these little guys, too. Plus, the houses look so nice on your blue wall! Thanks, MulchMaid! They are a lot of fun. Now I have to do the cleaning thing this winter...which seems pretty easy. I hope you get the chance to get some one day, if you want cocoons next year let me know, I'll give you some! I've been curious about mason bees, but haven't yet taken the plunge into buying a house. The whole cleaning process confuses me, though. How do you keep from killing the babies if you clean the box after they've been laid inside? Hi Alison, yes, it is confusing - you remove the cocoons - that's why you have tubes with removable liners. You just pull the tubes out, cut it open and take out the cocoons. Clean the box, put in fresh liners and mount the clean box for the following spring, empty. Mean time, the cocoons which are now out of the tube and cleaned are kept in a separate plain ol' cardboard box outside, loose in the box. Come spring you punch a hole in the box, they fly out through the hole and in theory, find the freshly cleaned box mounted on your home (or wherever). Apparently they are very tough and can take all of this cleaning with no problem, as long as you do it at the right time (Nov-Dec). I hope that doesn't make it more confusing! Thanks for the reply, Tamara. That helps to clarify things. 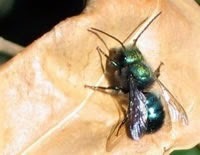 I'm going to a mason bee presentation at Molbak's this weekend. I may end up with some mason bees! Very nice summary. I think this would be a great project to do with kids. We don't have any of those, but we do have an orchard so you've got me thinking. Thanks for reading, Sarah! I'll do what I can and am happy to do so! Love these little bees! Your story is very interesting and you have so many beehives on your pretty blue wall. I am thinking about it, where can I hang or place them facing east. Hi there Nicole, thank you so much for reading! These little guys and girls are incredible, and so gentle. I love watching them! We can make a difference, and I'm surprised at how easy it is to host these guys, I have done nothing other than put up a house! Thanks, Nicole! Cheers! I do love the idea but the cleaning thing is very indimidating. Please promise you'll write about it after you do it. Aaah, will do, Danger, I promise, with photos and everything! I love all the different styles. Mine is rather plain, comparatively speaking. Great post. Thanks Grace! It just happened that way, I'm more of a matchy-matchy- person so if given the choice initially, I would have bought all the same kind. But now I like the different styles, there are a lot to choose from, indeed! thanks for reading! I have a mason bee house, too, although it's still too cold here for me to put out the cocoons I saved from last year. My cocoons have been in the fridge all winter in their paper tubes. This is only my second year with a bee house. I think I'm supposed to put in new liners after the little guys hatch. ?? Hi Casa Mariposa, I think yes, after they hatch you are supposed to replace the liners, but that is tricky as far as timing and has been my problem. They seem to go BACK into the same liners to build a new cocoon within days of hatching. D'oh! What was suggested to me is when they're ready to hatch, put the whole thing in a paper bag with a little hole for them to escape when they hatch and that way they won't go back in. This gives you time to clean out the box and put new liners in, and it's also helpful to have a clean, ready to go box with liners hung up at the same time so the newly hatched guys have a place to build more cocoons right away. Thanks for reading! !